This hotel is designed to be a home away from home for those with extended-stay needs. 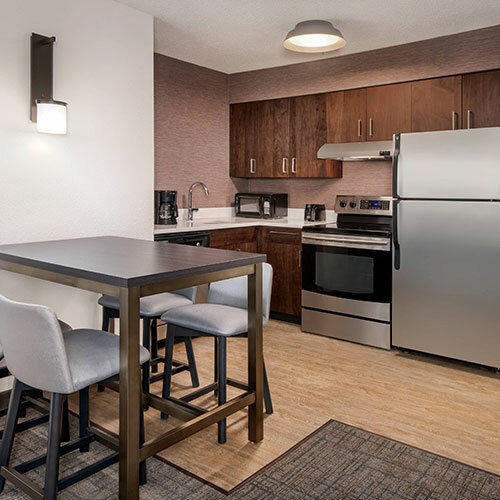 The spacious, updated rooms and kitchenettes are sure to please. Guests can grill up a steak by the pool or pick up a game on the sports court. Smoke free premises. 120 units, some two bedrooms, efficiencies and kitchens. 3 stories, interior corridors. Accessibility (Call). I-75 exit 271, just e. 3443 Busbee Dr 30144.
valet and coin laundry, area transportation-within 5 mi, M-F before 5pm.